I love that I can make these ahead of time and freeze them. Then, just pop it in the oven while you shower and get ready for the day. By the time you're ready to leave, you'll have a hot breakfast ready. These really are perfect. I loved the guide towards the bottom that shows various cookies and what is wrong with them (too much flour, cooked at too high of a temperature, etc.). I'm seriously impressed with the recipe! I used a postage scale to weigh the ingredients. This was my favorite find. It was DELICIOUS! You could easily serve this to non-vegans and I'm convinced that everyone would be happy. Yum, yum! It does take some time to make, but it was worth it in the end. The cashew "cheese" was my favorite part--it would be great on sandwiches too. The only downside to this recipe is that it wasn't very good as leftovers. I loved it for a day or two, but after that it was mushy and blah. So, eat it quickly! This soup comes together very quickly--it's great for dinner right after a long day at work. I added the zucchini because I live in Utah and still have frozen zucchini leftover from my summer garden. In a large pot, heat vegetable oil. Add stir fry mix, garlic, and cumin. Stir and cook until peppers are tender (about 5 minutes). Add chilies, tomatoes, corn, black beans, zucchini, vegetable broth, salt and pepper. Bring to a boil. Simmer, uncovered, stirring occasionally, for 30 minutes. Ladle into bowls. 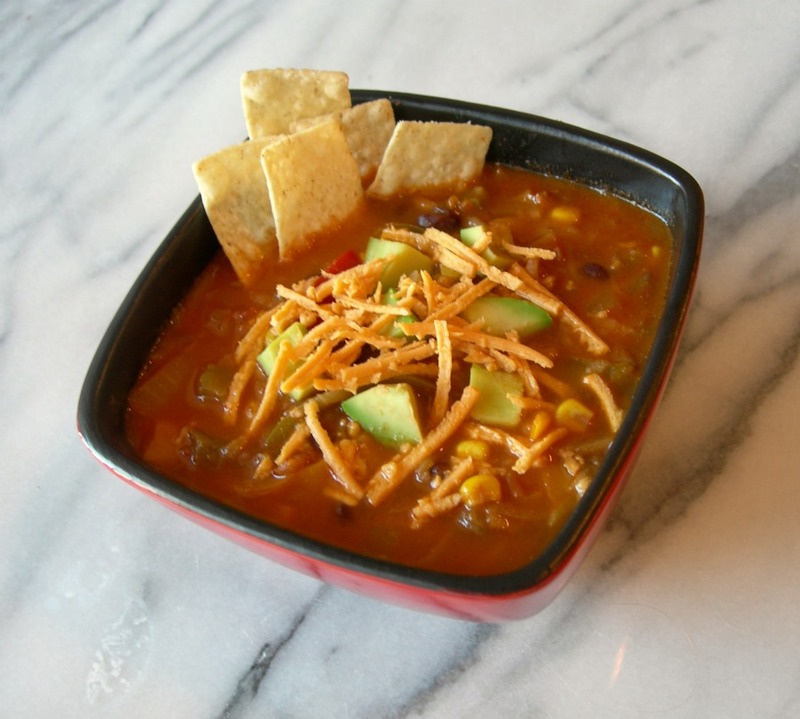 Top with chopped avocado, cheese, and tortilla chips. I'm sorry for the lack of posts lately. I moved a few months ago (for the sixth time since this blog started) and the lighting in this new place just isn't conducive to good pictures. I'll keep working on it--but in the meantime, enjoy these yummy crackers. Combine all ingredients in a medium bowl. Line a baking sheet with parchment paper. Place dough onto middle of baking sheet. Put another piece of parchment paper on top. Use a rolling pin to roll out dough to fill the entire baking sheet. Use a pizza cutter to score dough into cracker-size pieces. Bake at 400 degrees for 20 minutes or until crackers are crisp and edges are lightly browned. I like mayonnaise, much more than I should. Sandwiches without mayo usually just don't work for me. However, this one is delicious! It's much healthier, and pretty quick to put together. Serve it open-faced. Rinse and drain Cannellini beans. Combine beans, olive oil, salt, and pepper in a food processor and pulse until moderately smooth. If you don't have a food processor, mash the beans with a large fork and mix with the other ingredients. Toast bread. Spread bean mixture on top. 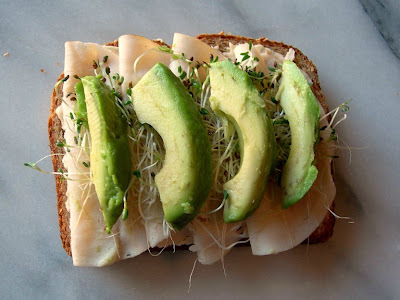 Layer avocado slices, sprouts, cucumber slices, thin strips of red onion, and chicken on top. I love the flavor of this salad. If you don't have a food processor, chop everything finely for similar results. Cook orzo until al dente. Drain. Set aside. 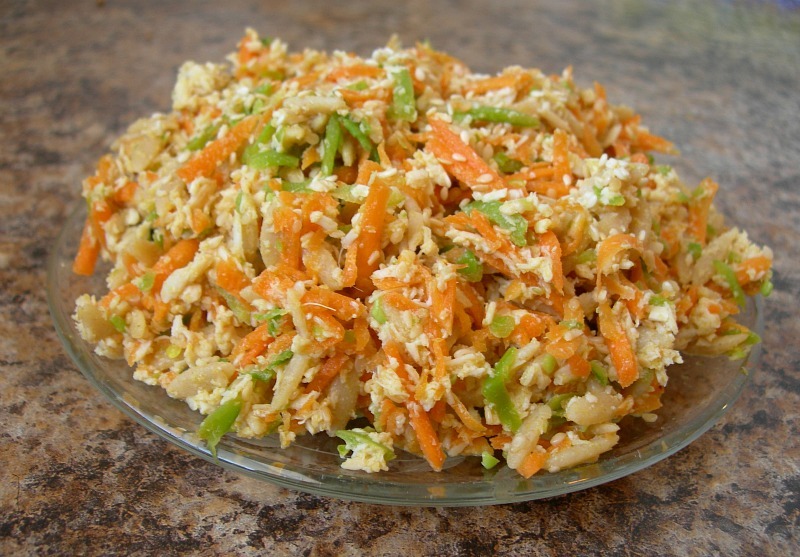 Use food processor to shred carrots, sugar snap peas, and chicken. 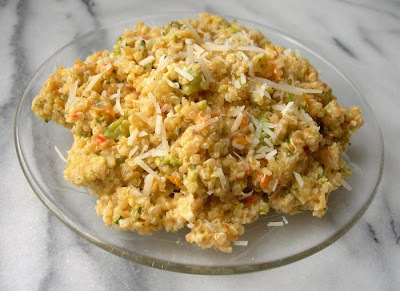 Combine with orzo. In a small bowl, whisk together vegetable oil, rice vinegar, soy sauce, and sesame oil. Lightly toast sesame seeds. Add to wet ingredients. Combine garlic and ginger in a saucepan with a small amount of oil. Stir and cook until fragrant. Add to wet ingredients. Combine wet ingredients with vegetables, chicken, and orzo. Chill thoroughly. 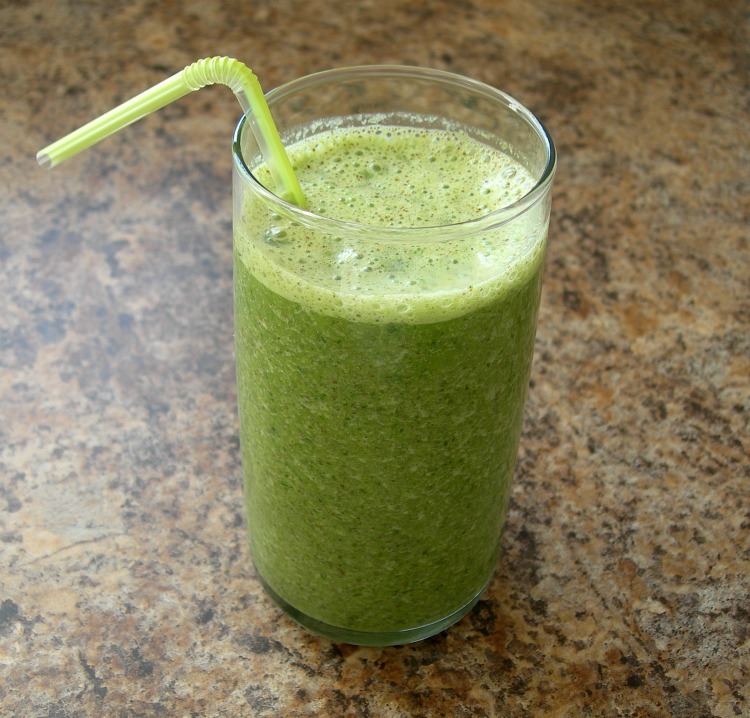 I tried green smoothies a few times in the past, and I never liked them. Then I tried a magical addition and suddenly they were fabulous. The addition was a straw. I don't know why it made such a difference, but I now love green smoothies for breakfast. My job requires waking up at O dark thirty, so I prefer to assemble the smoothie beforehand. I put everything but the banana in the personal blender and put it in the fridge. Then in the morning I pop in a frozen banana, blend, and go. Combine all ingredients and blend until smooth. Serves one. This is the first time I've cooked spaghetti squash, and I was quite happy with the results. You'll only end up using about 1/2 of the squash for this recipe, so find another spaghetti squash recipe to try as well. Preheat oven to 375 degrees. Use a wooden skewer to pierce holes in the whole spaghetti squash. Place the squash in a baking dish, and cook for 90 minutes. Remove from oven. In a small saucepan, combine olive oil and garlic. Cook until garlic is fragrant. Add spinach, basil, and tomatoes. Cook and stir until greens are wilted and tomatoes are warmed. Cut cooled spaghetti squash in half. Use a spoon to scoop out the seeds, and then a fork to get the stringy "spaghetti" out. Add olives, feta cheese, and desired amount of spaghetti squash to saucepan. Stir. Serve warm. Save remaining squash for another dish. I'm experimenting with freezing it--I'll post an update later. Plain strawberries would be more healthy, but as far as desserts go this is DELICIOUS and fairly healthy. This is my newest favorite recipe. Wash strawberries and cut into quarters. In a medium bowl, whisk together sour cream, brown sugar, and cinnamon. Add strawberries. Stir until combined. Serve. I started my garden terribly late this year. In fact, I only planted it about two weeks ago. However, my basil is already growing well and I'm excited to have enough to make delicious pesto. This stuff is fabulous! 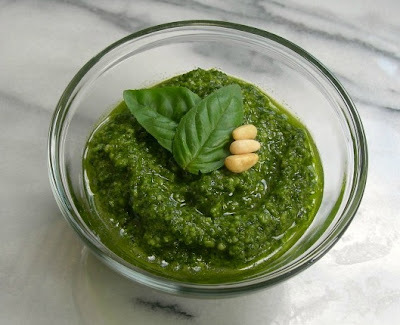 Combine basil, garlic, cheese, and nuts in food processor. Pulse until fairly smooth. Drizzle in olive oil while pulsing food processor until desired consistency is reached. For a cheaper version, I've heard of (but not tried) using Parmesan cheese and walnuts. A recipe similar to this one has been in my "to be baked" file for a long time. I decided to try out a homemade Funfetti mix rather than buying one from the store, and I like the results! I was surprised how fast it all came together. Combine flour, sugar, baking powder, and salt in a mixing bowl. Add eggs, canola oil, and vanilla. Mix until combined. Fold in sprinkles. Roll cookies into balls, bake at 350 for 11-13 minutes. Let stand on cookie sheet for 1 minute, then remove and let cool. 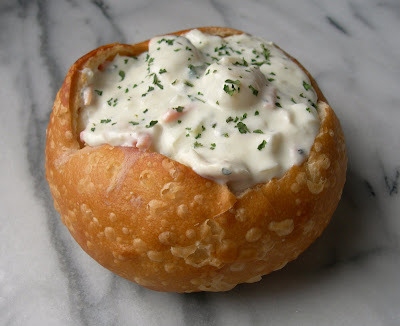 Put cream cheese in a small bowl and beat with an electric mixer. Add powdered sugar and vanilla. Mix well. Add milk while beating until desired consistency is reached. 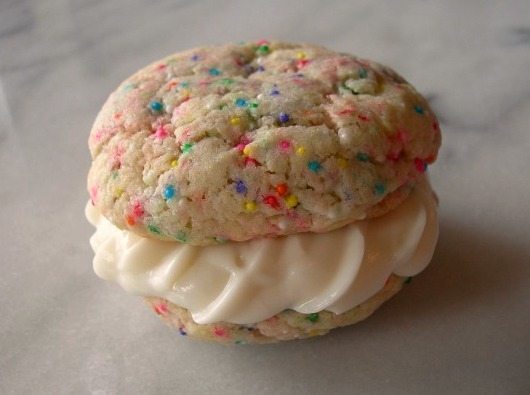 Spread frosting between cookies and enjoy. I'll admit that the first bite I took of these brownies was not my favorite. Due to my impatience and sweet tooth, I tried to eat one less than 30 minutes after they came out of the oven. It did not work. Several hours later they set up and everything went much better. I'm excited to make these again and experiment more with the recipe. The next thing I want to try is having unmelted white chocolate chips in the brownie batter. To make the brownies, melt 1/2 cup white chocolate and 1 cup butter on the stove or microwave. WATCH CLOSELY and stir frequently because white chocolate burns very easily. Add eggs and sugar. Mix well. Add flour and vanilla. Mix well. Pour into a greased 9x13" pan. Bake at 350 for 30-35 minutes or until done. To tell if they are done, stick a skewer into the center of the pan. There should be moist crumbs on the toothpick when removed. If you see smears of raw batter, keep baking. To make frosting, melt 1/2 cup butter and 1/2 cup white chocolate. Add powdered sugar and flavoring. Stir well. Add milk until desired consistency is reached. Frost brownies. Let set and then enjoy! Now that Utah's finally started to warm up it's time for frozen desserts. I made these in my mini cheesecake pan but next time I think I'll just make them in a pie dish and serve them like regular pie. Spray a pie dish or square pan with non-stick cooking spray. Combine Oreo crumbs and melted butter. Press into the bottom of prepared dish. Place into freezer. Using an electric mixer, beat cream cheese until smooth. Add sweetened condensed milk, whipping cream, lime zest, lime juice, and sugar. Mix until well-combined. Add green food coloring if desired (I used 1 drop). Pour cream cheese mixture over crust. Freeze for at least 30 minutes. Remove from freezer five to ten minutes before serving. 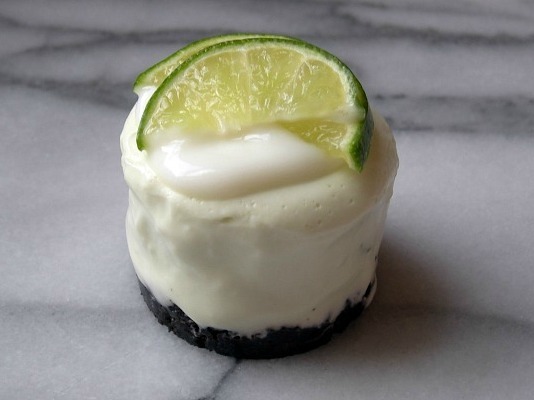 Top with whipped cream and lime slices if desired. 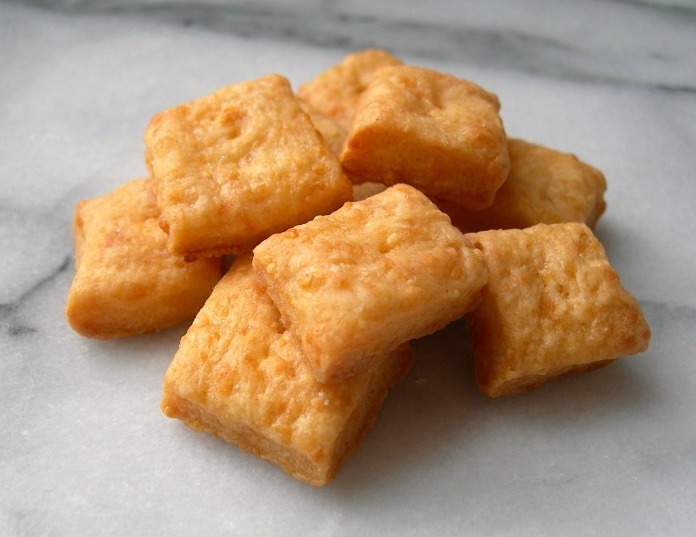 These homemade Cheez-Its have the perfect flavor. Really. They're worth a try! 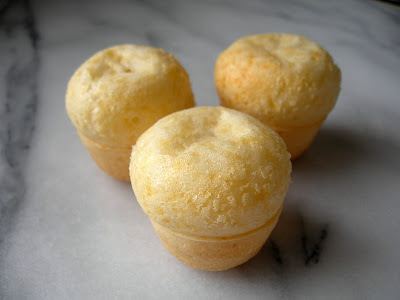 Combine flour, butter, cheddar cheese, salt, and cayenne pepper in a food processor until crumbly. Add water by spoonfuls until a dough consistency is reached. Wrap dough in plastic wrap and put in the freezer for 30 minutes. Unwrap dough and use a rolling pin to get it as thin as you possibly can. If you have a pasta roller, this would be a great thing to use it for. Then use a pizza cutter to cut the dough into small squares. Line a cookie sheet with parchment paper. 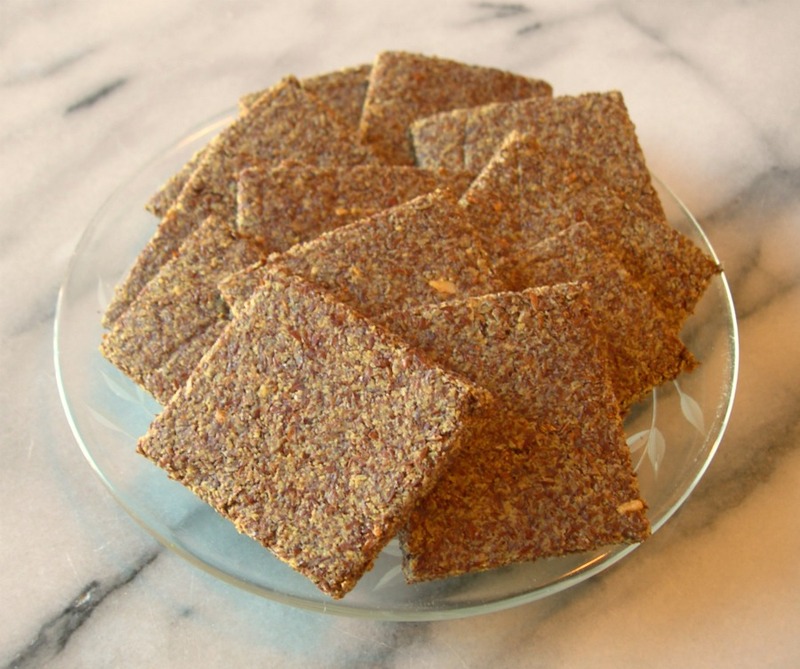 Bake the crackers at 350 degrees for 25-28 minutes or until crispy and the bottoms are golden brown. 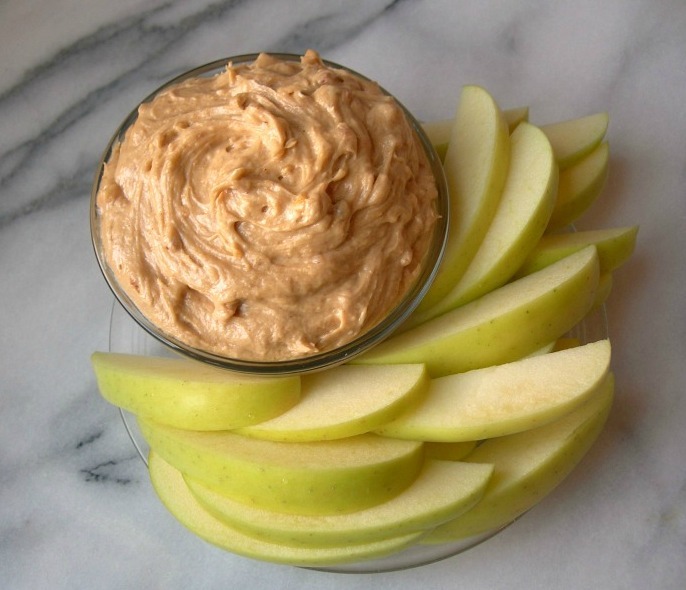 Plain apples are good, but plain apples + peanut butter dip is even better! This would make a good brownie frosting as well. Combine all ingredients with an electric beater. Add more milk to achieve thinner consistency if desired. Best if chilled. I've been using chicken thighs more often lately--they have more flavor than chicken breasts and cost less too. 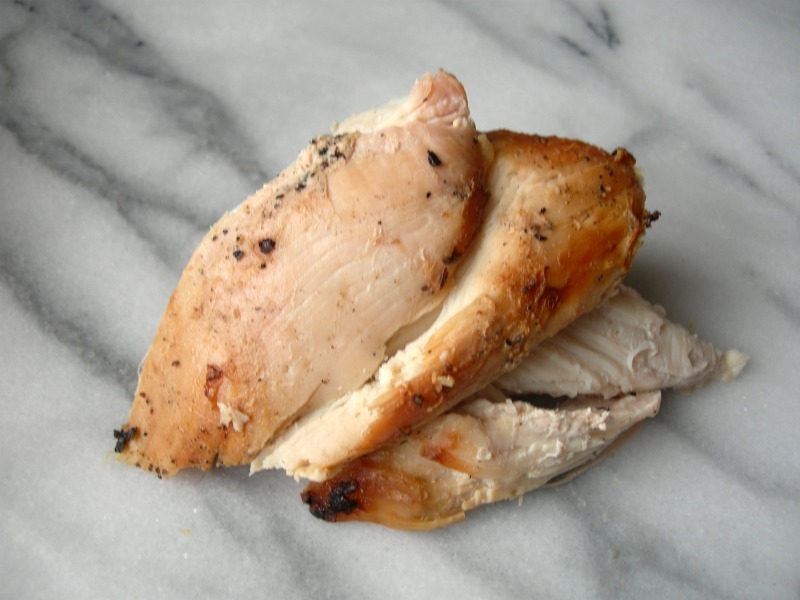 The thighs do have a higher fat content than the breasts do, but still have less fat than beef or pork. Used in moderation, chicken thighs are a good addition to your dinner menu. Combine yellow mustard, vinegar, brown sugar, mustard powder, hot sauce, Worcestershire sauce, salt, and pepper in a small bowl. Reserve 1/4 of the sauce in a separate bowl. 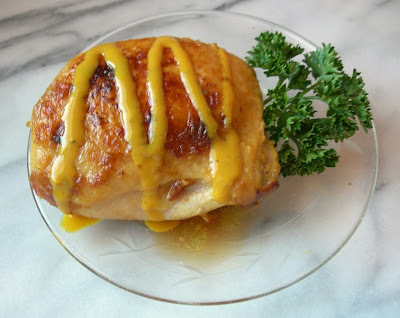 Baste chicken thighs with sauce. Heat olive oil in a medium frying pan. When hot, add chicken thighs. Cook 8-12 minutes (depends on size of thigh) on one side without disturbing. Flip thighs over, baste with sauce, and cook for an additional 7-10 minutes or until done. Top with reserved mustard sauce. 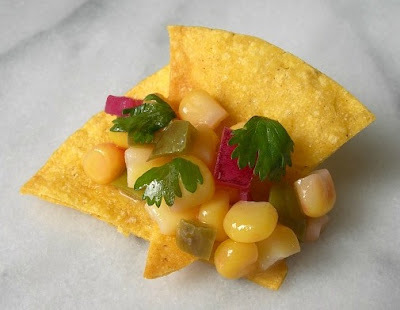 I ate this delicious salsa with tortilla chips, but I think it would be great on top of tacos or burritos as well. It should be fairly cheap to make--great for big summer parties. Fresh corn will taste the best, but frozen can be used too. Put on disposable gloves before cutting the jalapeño. Then dice the jalapeño into small pieces. The heat comes from the seeds and white parts, so if you want it to be mild, cut out all of those. If you don't have gloves, rinse your hands with rubbing alcohol or hand sanitizer to get rid of the remaining jalapeño oil on your hands (otherwise you're going to be in for a surprise when you take out your contacts). Combine all ingredients and chill for several hours. Here is this morning's "let's see what I have in the pantry" recipe. 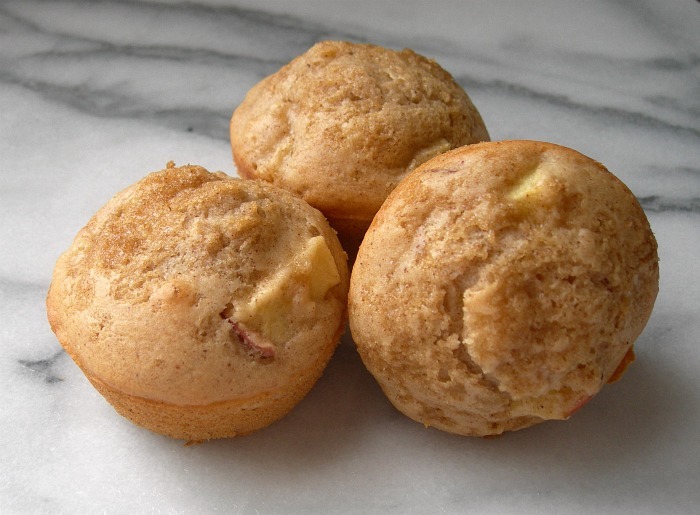 These muffins are best served warm with a little bit of butter or jam. Don't bother peeling the apples. Whisk together apple juice, egg, vegetable oil, sugar, and honey. Stir in flour, baking powder, cinnamon, nutmeg, and salt. Fold in apples. Grease a muffin tin. Fill muffin cups 3/4 full. Lightly sprinkle each muffin with brown sugar. Bake at 400 degrees for 18-20 minutes. These cheese puffs are deceptive--they're light and fluffy, but as soon as you bite into one you realize that they are deliciously gooey on the inside. Make these right before serving as they do not keep well and should be eaten within a few hours of baking. Preheat oven to 450 and grease a mini muffin tin. Combine all ingredients in a blender and blend until smooth. The batter will be liquid. Pour batter into mini muffin tin, filling each one about 1/2 to 2/3 full. Bake for 13-15 minutes or until the breads puff up and become very lightly brown on the edges. Cool slightly (the tops may cave in a bit, that's okay) and then serve. 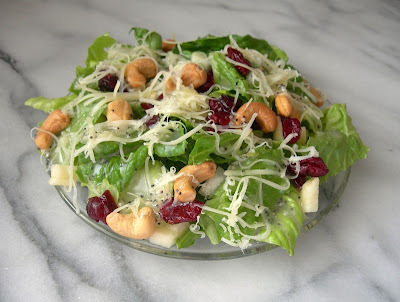 The original title of this salad is something along the lines of "Winter Salad with Fruit"; but, I made it for Easter dinner and I've decided that it defies all seasons. The dressing is my favorite part--it's definitely a winner. There is more dressing than you'll need for just this salad, so if you don't want leftovers, only make half of the dressing. Combine lemon juice, zest, sugar, onions, mustard, and salt in a blender or food processor. Pulse until smooth. Add oil and poppy seeds, blend until well-combined. Refrigerate overnight. If you are not planning to serve the salad immediately, mix a bit of lemon juice in with the diced apples and pears to prevent them from turning brown. Combine lettuce, apple, pear, cheese, cashews, and cranberries just before serving. Top with dressing. Last Sunday I was planning to toss this turkey breast in the slow cooker, go to church, and come home to a delicious dinner. That plan failed when I realized my slow cooker is much too small to even consider putting something this size in it. I ended up searching online and found this great recipe from Cook's Country. It's simple, fairly quick, and honestly one of the best tasting turkeys I have ever had. Rinse turkey breast in cool water. Pat dry with paper towels. 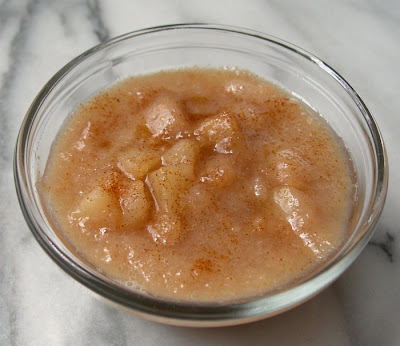 Combine 2 Tbsp brown sugar and salt in a small bowl. Gently loosen skin on turkey. Rub brown sugar and salt mixture onto and under skin. Wrap turkey tightly in plastic wrap and refrigerate at least 8 hours. Remove plastic wrap. Pat turkey dry again with paper towels. Combine remaining 1 Tbsp brown sugar and pepper in a small bowl. Rub onto and under turkey skin. Use a skewer to poke numerous holes throughout the turkey breast. Cut butter into very thin slices. Scatter butter slices under skin. Turn all burners on gas grill to high. Cover, and let heat for 15 minutes. Leave primary burner on high. Turn off all other burners. Place turkey breast, skin side up, on cooler part of grill. Cover and grill. Lift lid only once, after about 40 minutes, and rotate turkey breast. Continue cooking until thickest part of meat registers 160 degrees on meat thermometer (about 70-90 minutes). Remove from grill. Cover with foil and let rest for 20 minutes. Serve. Have you tried quinoa? It seems to be the newest wonder food that's popping up in recipes everywhere. Quinoa is a grain that is unique because it is also a complete protein (like meat). The name is pronounced KEEN-wah and it tastes like a mixture between oatmeal and brown rice. Rinse quinoa in warm water. Combine quinoa and broth in a saucepan. Bring to a boil. Once boiling, reduce heat slightly, keep covered, and allow to cook until all broth is absorbed--about 20 minutes. Meanwhile, wash and chop vegetables. Anything will work. I used zucchini, sweet onion, red bell pepper, orange bell pepper, and broccoli. Heat olive oil in a medium skillet. Add garlic and vegetables. Cook until vegetables are crisp-tender. Once all the broth has been absorbed by the quinoa, add cream cheese and basil. Continue stirring and cooking until cream cheese is well-distributed. Add vegetables. Stir to combine. Top with Parmesean cheese if desired. Serve. I bought quite a bit of fruit early last week, and then went out of town for the weekend. When I came home, there was a big bowl full of over-ripe fruit demanding immediate attention. I just threw all the pears into the slow cooker because I didn't really want to spend all day cooking, and they turned out fabulously. Yum! Remove the cores and peels from the pears. Dice pears into uniform-sized pieces. Place into a 2 qt slow cooker. Top with brown sugar and cinnamon. Cook on high for 4 hours or until pears are extremely tender. Mash with a fork or use a blender until smooth. This salad was a good accompaniment to our mid-Conference picnic. General Conference is always a rejuvinating weekend full of uplifting messages and instruction. We liked the Asiago cheese, but if you are cooking for children you may want to use cheddar or another mild cheese. Combine pasta with salami, pepperoni, cheese, olives, peppers, tomatoes, and dry Italian dressing. In a small bowl, whisk together olive oil, balsamic vinegar, oregano, and parsley. Pour half of the dressing into the salad and mix well. Refrigerate salad and remaining dressing. Just before serving, add remaining dressing and mix well. Mmmmm. These doughnuts were a fun Sunday morning project. The glaze is my favorite part! Combine yeast and water in a small bowl. Let sit for 10 minutes. Cream together milk, shortening, sugar, salt, and eggs. When smooth, add yeast mixture. Mix in flour. Knead for five minutes or until smooth. Cover bowl with a damp cloth and let rise for 1-2 hours or until doubled in size. Turn dough onto a lightly floured surface and roll out to 1/2" thickness. 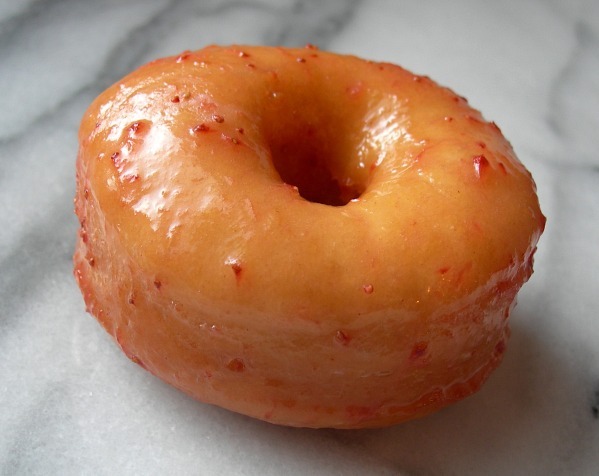 Using biscuit cutters or a glass, cut out doughnuts. Let rise for an additional 1-2 hours. In a heavy saucepan, heat vegetable oil to 350 degrees. Set a cooling rack over a sheet pan and set aside. Fry the doughnuts until golden brown on one side, then flip over using a chopstick. When evenly brown, remove from the oil and let drain on the prepared cooling rack. Defrost strawberries in the microwave. Pour off liquid. Puree in a food processor. Melt butter in a small saucepan. 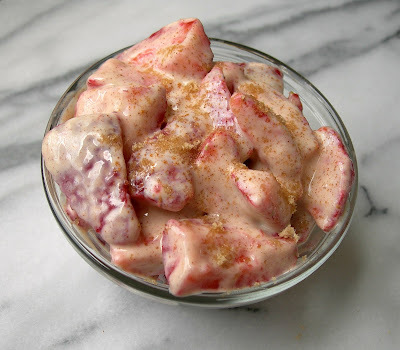 When melted, add in pureed strawberries. Stir in powdered sugar until glaze reaches desired consistency. Cook and stir until smooth. Dunk cooked doughnuts into glaze and then return to cooling rack until glaze hardens. Enjoy! These are best if eaten immediately (which won't be a problem). Today is the first time that I've made this recipe. I really liked it! The original recipe calls for flour tortillas; but, corn seemed more suitable for enchiladas. In a medium pot, combine chicken, onion, sour cream, and 1/4 cup each Mozzarella and Cheddar cheeses. Heat and stir until cheese melts. Add parsley, oregano, pepper, salt, chili powder, garlic, tomato sauce, and chilies. Cook and stir until heated through. Divide chicken mixture between the tortillas. Fold and place (seam side down) into a 9x13 pan. 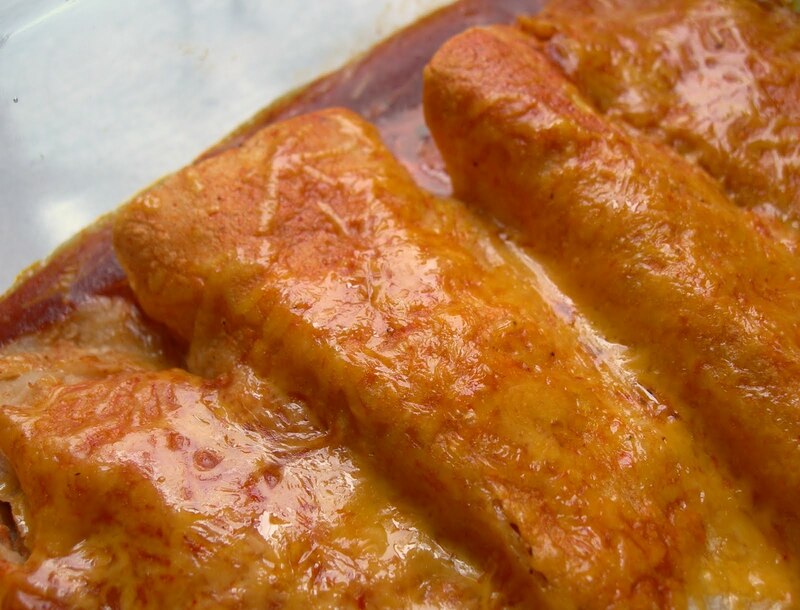 Pour enchilada sauce over the enchiladas. Top with remaining 3/4 cup Cheddar cheese. Serve with shredded lettuce, sour cream, and diced tomatoes. 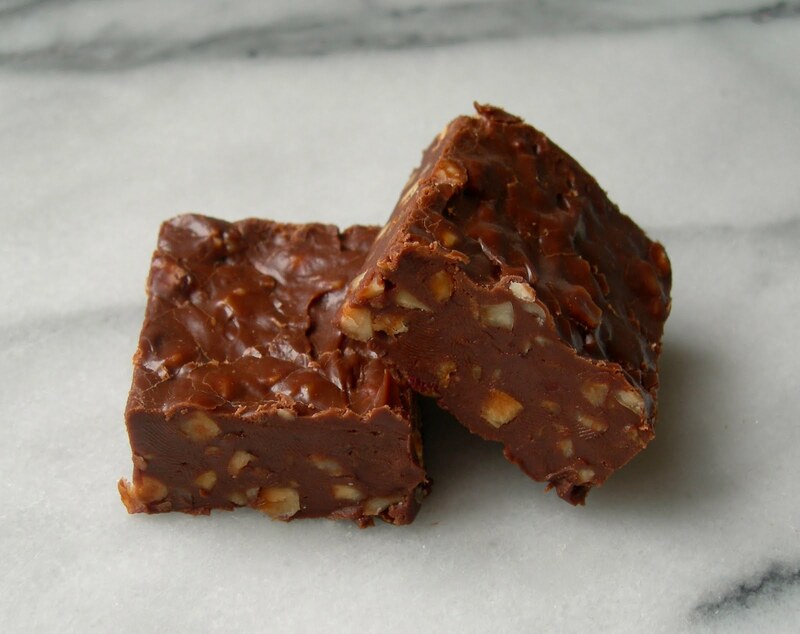 I'll admit that this fudge isn't as delicious as the more labor-intensive fudge recipes. However, it is still pretty good. It's great for those "I need chocolate, and I need it now" kind of days. Line a square baking pan with aluminum foil. Use butter to grease the foil. Stir together chocolate chips and sweetened condensed milk in a large microwaveable bowl. Microwave on high for 4-5 minutes. Stir until smooth. Mix in nuts. Pour fudge into prepared pan. Cool until firm. 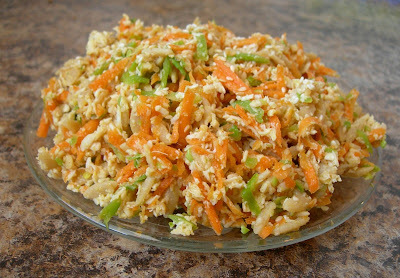 The recipe for this salad came from Mary Perkins--a kind old woman who lived up the street from me when I was a child. Mary had an English Setter named Lucky that she was more than happy to let me play with. Every time I have this salad I think of her. Also, this salad is guaranteed to be a winner at pot lucks! 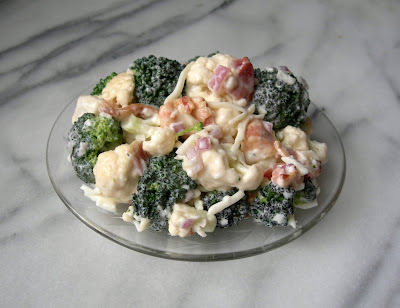 Cut broccoli and cauliflower into bite-size pieces. Dice red onion into small pieces. Depending on how large the onion is, I use 1/3-3/4 of it. Combine mayonnaise, sugar, vinegar, and salt in a small bowl and whisk together. Cover with plastic wrap and refrigerate for several hours. Typically, I refrigerate everything separately overnight and then combine all the salad ingredients immediately before serving. That guarantees crisp vegetables that don't have an overwhelming onion flavor and bacon that isn't soggy. Muenster cheese is one of my favorites. I love it in salads and on sandwiches. 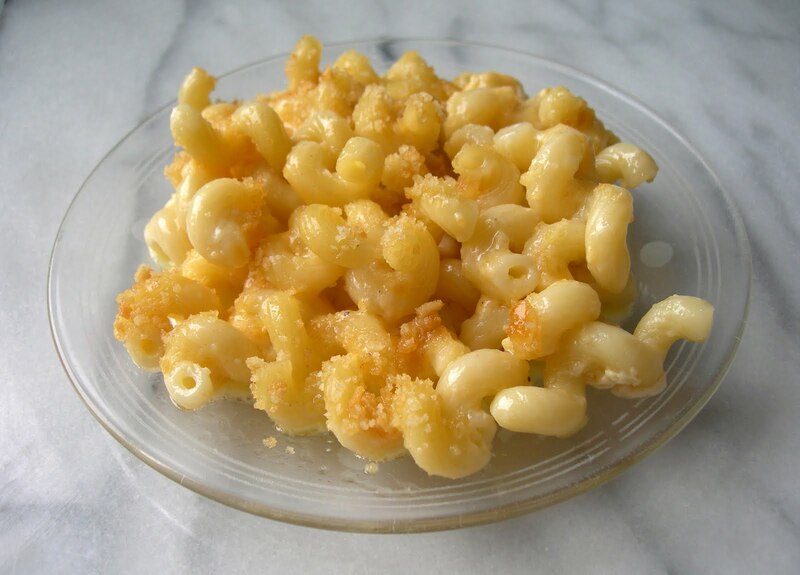 When I saw this recipe for a mild mac 'n cheese with Muenster, I knew I had to give it a try. Cook pasta according to package directions, just until al dente. Drain. While pasta is cooking, melt 4 Tbsp butter in a medium saucepan over low heat. Once melted, add in milk and cheese. Continue cooking and stirring until cheese is melted. I found it helpful to switch to a whisk once the cheese started melting. Add salt and pepper to taste. Once cheese is all melted, stir in noodles. Spray a 9x13 pan with cooking spray. Pour in noodle/cheese mixture. Place Ritz crackers in a sandwich bag. Crush crackers. Melt 1 Tbsp butter and combine with crackers. Sprinkle buttered cracker crumbs over noodles. Bake at 400 for 15 minutes or until crackers are golden brown. Serve immediately. It's Girl Scout Cookie booth time! Hurray! This post actually doesn't have anything to do with Girl Scouts--but I wanted to put in a plug for their cookie booths which are appearing this weekend. These yummy cookies are a homemade version of Pepperidge Farm Milano cookies. You can pick any flavor you like--orange is my favorite. 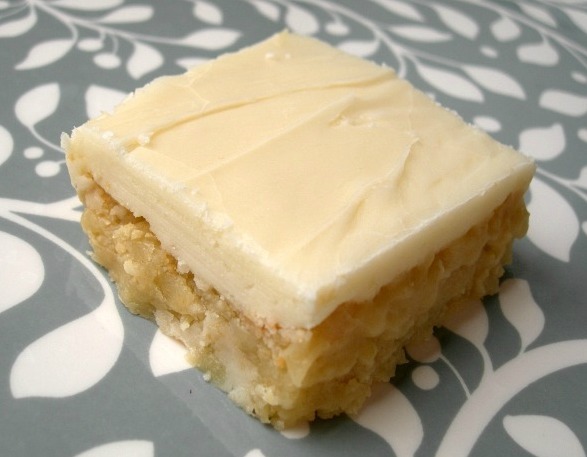 The cookie base is a great shortbread recipe too. Cream butter and sugar. Add flour and salt. Stir until well-combined. Stir in vanilla. Wrap dough in plastic wrap and chill in the refrigerator for at least 30 minutes. Roll dough into a log. Cut into 1/2" slices. Line a cookie sheet with parchment paper. 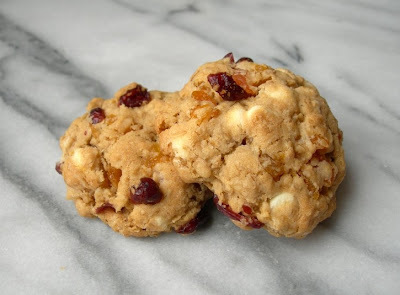 Place cookie slices on top of parchment paper. Bake at 350 for 10-13 minutes or until edges brown slightly. Melt chocolate chips (in saucepan or microwave). Stir in flavoring extract. Sandwich cookies with melted chocolate in between them. I haven't made it to the grocery store for awhile, but I fortunately had all the ingredients for these meatballs. It's always nice to find a recipe that doesn't require a trip to the store (even if it is only a 1/2 mile away). Combine all ingredients in a large bowl and mix until well-combined. Form into meatballs and place into an oiled 9x13 pan. Bake at 350 for 12 minutes. Turn meatballs over and broil for 2-3 minutes or until lightly browned. Combine with sauce and serve. Makes about 20 meatballs. Have you tried gnocchi before? They're delicious little potato dumplings that add an interesting texture to this soup. You can find gnocchi near the dry pasta in the grocery store. They're worth a try! I made this soup for a brainstorming session to plan my next vacation with two friends. The winner---Alaska! Cook (any method works) and dice chicken. Set aside. Combine onion, celery, garlic, butter, and olive oil in a large pot over medium heat. Cook until onion becomes translucent. Add flour to form a roux. Cook, stirring frequently, for 1-2 minutes. Add half and half, carrots, and chicken. Once mixture thickens, add chicken broth. When mixture thickens again, add cooked gnocchi, spinach, and seasonings. 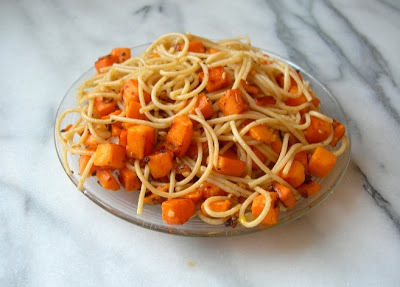 I love sweet potatoes, and this is one of my favorite sweet potato dishes. It comes together very quickly and is a little different than the regular lunch fare around here. If you want it to be more savory, add rosemary. Peel and dice sweet potato. Mince onion and garlic. In a small frying pan, combine approx. 2 Tbsp olive oil and diced sweet potato. Cook, stirring occasionally, until potato pieces become slightly soft. Add onion and garlic. Continue cooking until sweet potatoes begin to brown and are soft. Combine sweet potato mixture, drained spaghetti, salt, pepper, and rosemary in a serving bowl. Toss. Add more olive oil if desired. Top with grated Parmesan cheese. These are probably one of the least healthy foods imagainable--which also means they are delicious. 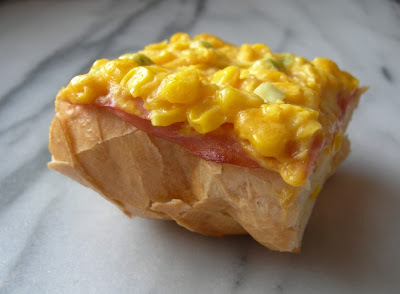 I used this recipe for a last-minute New Year's Eve appetizer and everyone loved them! Preheat oven to 325. Line a baking sheet with aluminum foil. Cut bacon into thirds (lengthwise). 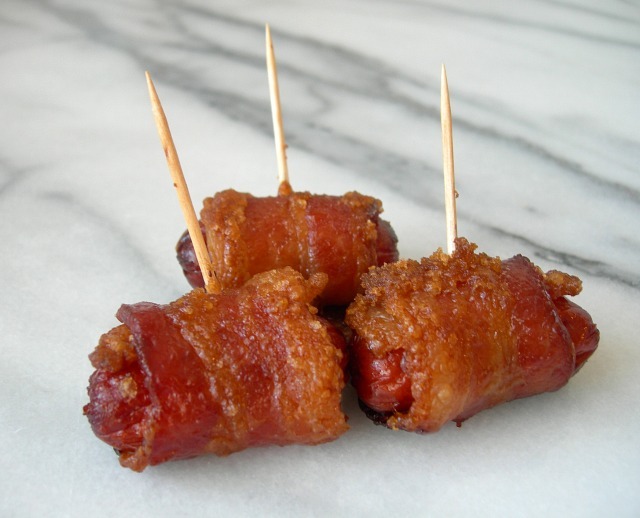 Wrap each cocktail weiner with a piece of bacon and secure with a toothpick. Place onto baking sheet. Sprinkle brown sugar generously over the bacon wrapped smokies. Bake for 40 minutes. 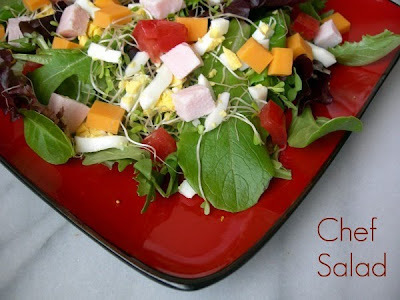 Chef Salad is one of my favorite comfort foods. It works well for a quick lunch, or for dinner when you don't feel like turning on the stove. My other favorite additions are pickled beets, croutons, cold green peas, cucumbers, peppers of any variety, olives, and fresh mushrooms. Mix everything together and then enjoy! Here is my method for perfect hardboiled eggs: Place desired number of eggs in a cooking pot and fill with cool water until water is 1" above eggs. Cook uncovered until water boils. When water boils, cover pot with a lid and remove from heat. Let stand for 12 minutes. Transfer eggs to a bowl of ice water and let cool for 10 minutes.